The International Coffee Organization (ICO) was established in 1963 in London under the auspices of the UN. It administers the International Coffee Agreement between coffee producing countries and consuming countries aimed to keep coffee prices stable. At a meeting that took place in March 2014, the ICO decided to launch International Coffee Day in order to emphasize the great economic importance of coffee, to raise awareness of the hardships that coffee growers face, and to promote fair trade coffee because of its contribution to sustainable development. The inaugural International Coffee Day celebration was held in Milan as part of Expo 2015. The holiday has been celebrated every year since its inception. On the occasion of Coffee Day, businesses in ICO member countries offer discounts on coffee and special deals for their loyal customers or social media followers. Anyone can join a celebration by creating their own events and activities dedicated to one of the most popular drinks in the world. 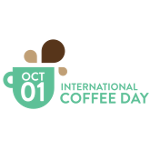 International Coffee Day is a great occasion to learn more about coffee and find new appreciation for the beverage.